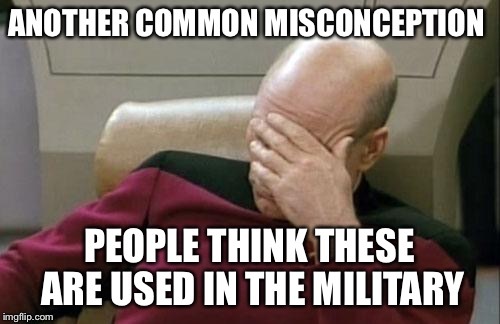 Completely agree, however, there are no military grade AR-15 rifle because the miltary are has M16A2, M16A4, and XM177/CAR-15, all of which have select fire capability. Unlike the semi only function you outlined as civilian use. Sorry, got on my soapbox a bit too long, I just like sharing information on firearms. 1. Nobody did ask you. 2. Your definition is arbitrary and completely stupid. 3. Abortion murders more children every year by far, but we aren't holding a national conversation on abortion. 4. Everyone not bringing up abortion but b**ching about guns is an idiot that cares more about advancing a political agenda than saving lives. 5. Only an utter moron would think yet another law - which criminals ignore - would solve the problem and keep people 'safe'. 6. Especially in light of the fact we already tried an "assault" weapon ban, and it failed miserably - like most Liberal policies fail, actually. You really should stop commenting and delete your account. But somebody did ask you. Stay in your own countries politics. 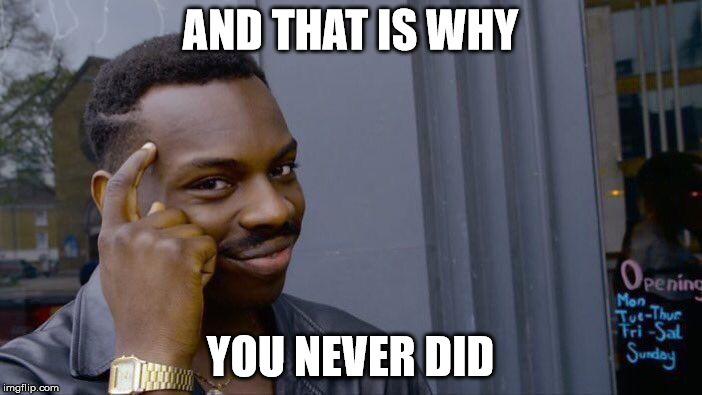 You don't get it, do you? All evidence points towards guns having a positive impact on people. If anybody's not getting the point, "mate," it's you. 43 families? You want to ban guns that are proved to save thousands of lives because of 43 lives? You will not be taking anyone's ARs. There is no proposal to confiscate anyone's guns. There have been discussions about banning future sales. Trying to confiscate guns in the US has been a colossally foolish move for hundreds of years. Really? Australia is almost a completely different country than the US. There are too many other variables you need to take into account before saying that such an admittedly small drop is gun control related. Actually, I don't think the law did anything. Gun violence was already on the decline when the law was enacted. Correlation =/= causation, and in this scenario that is especially true. Hmm... Where does this fit into your narrative on successful gun control in Australia? Functionally the same gun. The odd-looking grip is probably to get around some states' "pistol grip" prohibitions. Ban ovens! A grease fire can burn down an entire city block worth of people! Oh because black people are scary looking? Yeah, if only black people in this country were as well protected by our elected officials as these guns. Is that a constitutional right? Last time I checked, it wasn't. The fact that one-third of the population of the USA has more guns than many other countries combined is a great deterrent against total government tyranny. I understand that the government is and has been encroaching on our liberties and we are armed to the teeth. What do imagine they would be doing if we had no comparable weapons or none whatsoever? 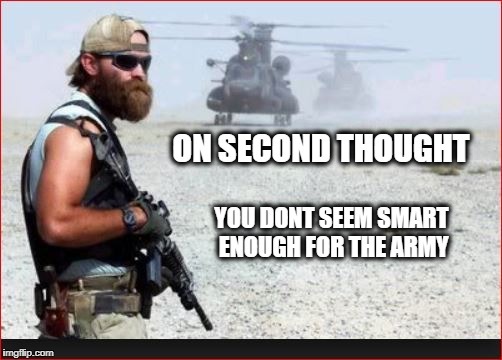 I'm less concerned about government tyranny (because of the great deterrent of an armed populace) as I am concerned about criminals and possible home invaders that have ARs and fully automatic weapons. And blow you up in the process. Huh? How is it not an assault rifle? a lightweight rifle developed from the sub-machine gun, which may be set to fire automatically or semi-automatically. You just defined a select fire weapon. "...may be set to fire automatically or semi-automatically." The AR-15 can only fire semi-automatically. The link to the ATF definitions states in sections 1, 2, & 3 that all the "machineguns" have a select fire capability or are only Fully Automatic. Not one of them includes a semi-automatic only weapon such as the AR-15. And yes, the AR-15 has been set to fire Semi-Automatically only. "Assault Rifle" is a broad class of firearms, it's not a type. Also, why are we even debating this? 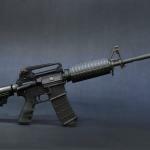 What difference does it make whether it's an assault rifle or not? Last time I check, human beings didn't have a common ancestor with ANY firearms, let alone assault rifles or any other rifles. Assault Rifles are rifles that can fire repeatedly, i.e. you can use them for assault. As opposed to Hunting Rifles (including military rifles). "Assault Rifle" is a CLASS of weapons, not a technical term to denote the type. For that, we instead use terms like Combat Rifle, Battle Rifle, Sniper Rifle or similar. Firearms are considered either handguns, submachine guns, machine guns, battle rifles, combat rifles, sniper rifles, anti-material rifles, recoilless rifles, launchers or cannons. Take your pick. None of them have human DNA in their design, last time I checked. You were the one that said an assault rifle is a CLASS of weapon, yet it was not included in your listing of what firearms are considered. Also, I asked you what class it would fall under, so you can take your pick. And in one of your previous comments you said you were talking about assault rifles and not machine guns, yet now you list machine guns and do not list assault rifles as a type of firearm, where is this contradiction in your explanations coming from? Because I listed the types, not the classes... Class denotes usage. Type denotes attributes. Why not go off of the definitions as outlined in the legislation (laws or statutes) surrounding firearms, since any violations is what definitions they would be prosecuted under? That is where I gather my definitions from, the governing body, the ATF. 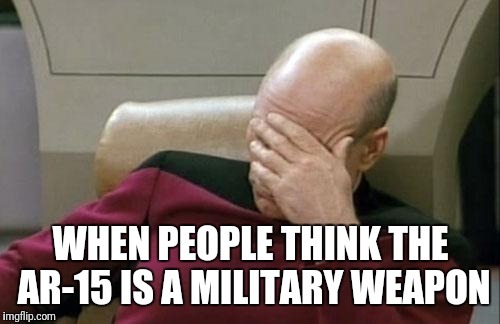 So under me asking what CLASS of weapon that rifle would fall under, you list the types, and say take your pick when you were talking about classes previously. So why don't choose what way you want to continue this discussion rather than swapping terminology and pointing it out rather than moving forward with reasonable discussion. Because, as you said yourself, "assault rifle" isn't a valid technical term and it's not even interesting what class the weapon falls under, because that depends on how the weapon is being used. You can't from a single picture and without knowing the exact model you're showing, tell what class the weapon falls under. All I can say is that the weapon you showed is most likely used for high caliber assault or precision shooting. 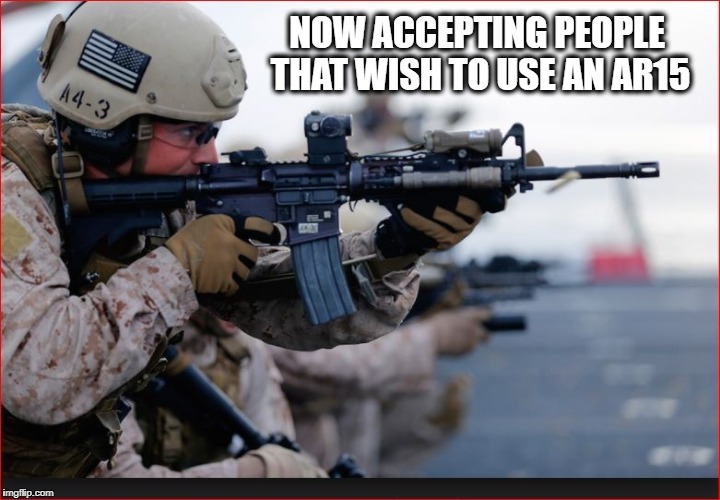 As in a high caliber battle rifle or sniper rifle (if a scope is added). Interestingly enough "Sniper Rifle" is another bogus specification, based on the historical snipe hunters of India. And wouldn't you know, this thread doesn't go any deeper... Thank God, now can we please go back to making memes and stop discussing petty irrelevancies? Thanks. And? I'm talking about assault rifles, not machine guns. As the federal law defines firearms, there are no "assault rifles" that is a media term to assist in instilling fear and a stigma around a certain type of rifle. Similar to what was done with different races not all that long ago. People who call semi-automatic firearms assault rifles when that is not what they are. Is like someone calling a 10 passenger van a bus because it carries more than 5 passengers at a single time. Which they both can do, but they operate completely different and under different regulations, laws, and licensing. You are comparing apples to oranges just cause someone painted an orange red. Laonsite, I'm sorry, but if I (me! Literally me!) Can easily beat you in an argument, you just may be wrong. 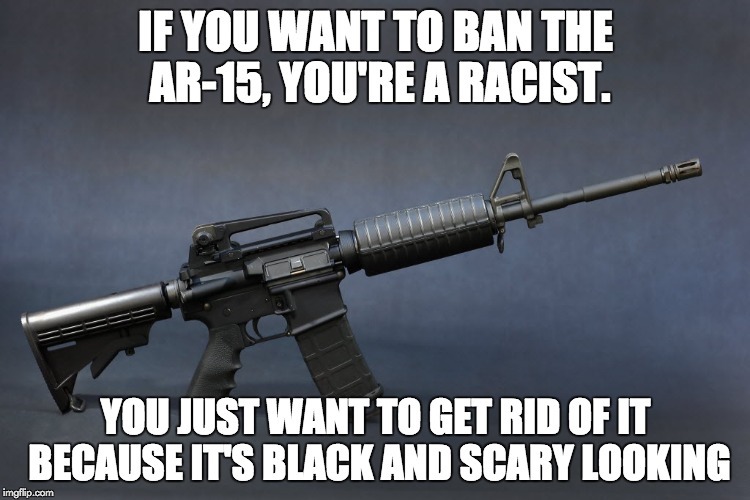 Have fun trying to take "assualt rifles" from people with education and facts. He (laonsite) doesn't even have a dog in this fight, he is part of the bunch that got kicked out of the US and then shot out of the US back in 1776-77.